This is a very special episode. Kenneth Cloke is a mediator, author, conflict resolution expert, and someone I have looked up to for years, and he's a friend. The Fractal Friends podcast is heavily inspired by the work Kenneth has done with conflict transformation and mediation. In this episode we discuss the ways that we can and must build a world that includes all voices, including those of our enemies. This episode provides and practical and optimistic vision of the future of democracy. Ken is the founder of Mediators Beyond Borders, an organization that works to bring mediation and peace skills to communities around the globe, so that they can, in turn, build a more peace “able” world. Learn more about Kenneth Cloke on his website. If we hope to build a world for all of us then we will not only need to look to the collective; our ethics will need to be grounded in the principle of self-determination. Self-determination is the value that every individual and every nation is sovereign and has the right to determine the course of their own life. It is an affirmation that we all have the answers we need inside of ourselves. Self-determination the core principle of mediation and interest-based conflict resolution. It is at the heart of consent, democracy and the creation of an inclusive society. We each get to want what we want. We each get to ask for and advocate for what we need. With the value of self-determination, however, we don’t get to insist that anyone participate in meeting those needs. This is a simple concept, but it has complex consequences. I mention the book called Predisposed during the episode. It talks about how people might be biologically predisposed to being liberal or conservative. 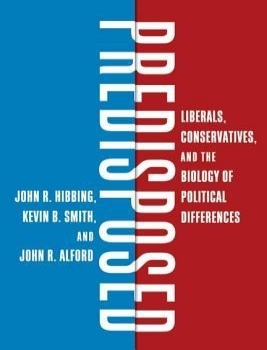 Predisposed: Liberals, Conservatives, and the Biology of Political Differences. Here's a test from Hibbing's book Predisposed to test if you're hardwired to be liberal or conservative. Fractals are mathematically defined as objects that exist between dimensions. They are entities that have a Hausdorff dimension that is not an integer (ie: 1.25 or 2.56; not 1, 2 or 3). They can be lines (1 dimensional) that behave like planes (2-dimensional) or “lines” (branches) that can fill 3-dimensional spaces (trees). They are a way of fitting infinite detail into finite spaces. The Koch Curve to the right is a line that gets so wiggly that it becomes infinitely long and has a dimension of 1.2619. If you want to go deep into studying fractals I suggest this course on Fractals and Scaling offered at Complexity Explorer. The Fractal Foundation also has some excellent resources. Their CEO Jonathan Wolfe also have a great TEDx Talk here. Here is a TED talk with Benoit Mandelbrot, the man who named and discovered fractals. Also Arthur C Clarke's documentary on fractals from 1995 called Colors of Infinity is a classic. Here is a comic that reflects the comment from Ken Cloke, "When we're all in the same boat it doesn't matter what side is sinking." Comic by Signe Wilkenson. Published 2018-09-21.